Historical is the first born boutique of Scaglione’s corporate; it is located outside the promenade, at only few meters from the harbor. The boutique has a large show on the road through 7 large windows and, inside, it develops over three floors, each one divided into several and specialized spaces. Downstairs there is Bridegroom’s Atelier, an area totally dedicated to the weeding where a man can find everything he needs in the most important day of his life. On the same floor, there is, moreover, the corner 'Classico_uomo', beating heart of Scaglione’s universe. In this area, customers can also enjoy an exclusive service "tailored" to create made- to-measure clothings. 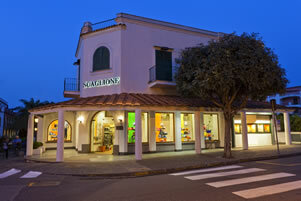 Whereas, on the ground floor people can find sportswear and fashion collection: Scaglione offers a wide selection of the best international brands. At last, on the top floor, there is a corner dedicated to accessories for men and women, especially from Furla’s collection.